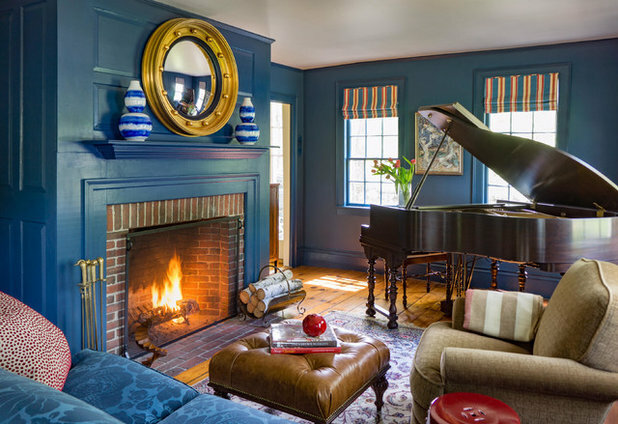 The parlor in this 230-year-old New Hampshire home had been expanded in a previous remodel, but it was short on pizazz. 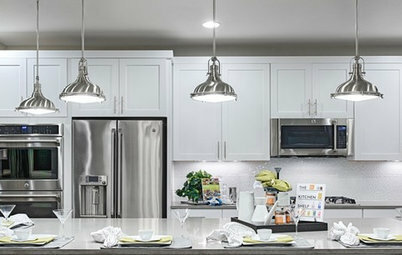 In addition to its lackluster looks, it didn’t serve a clear function for the homeowners, who weren’t exactly sure how to improve the space. 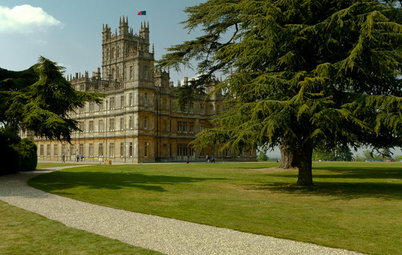 The long, narrow layout made arranging the furniture, which included a grand piano, even more challenging. 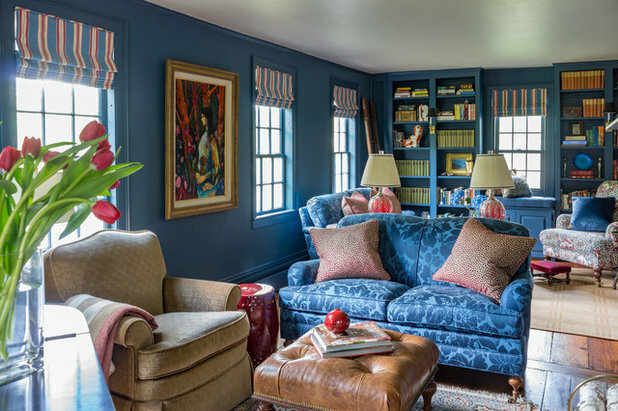 To crack the problem, homeowner and designer Amy Mitchell of collaborated with designer Dena Hamilburg to transform the parlor into a formal area for reading, entertaining and practicing music — all unified by a gorgeous blue hue. 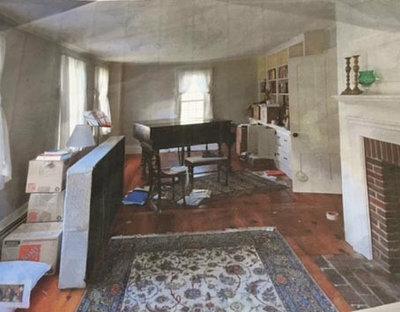 BEFORE: While most old homes tend to have small, cut-up rooms, this parlor had already been created by combining little rooms into one larger space. Its original wide-plank wood flooring was in good shape, and a wood-burning fireplace and ample windows provided fine architectural bones. The rest of the decor was more dull than delightful. Flat white walls and a white baseboard heat register erased much of the room’s Federal-style charm. 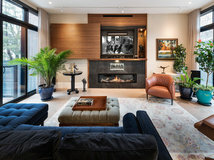 Despite its open configuration, the room still felt disjointed, with a fireplace at one end and a built-in bookcase at the other. The bookcase base was deep and commanded a fair amount of precious floor space. AFTER: Now a library occupies this end of the room, while the other end contains a seating area and grand piano, at which Mitchell practices opera. At one point, the Mitchells considered adding pilasters in the middle to divide the space, Hamilburg says. 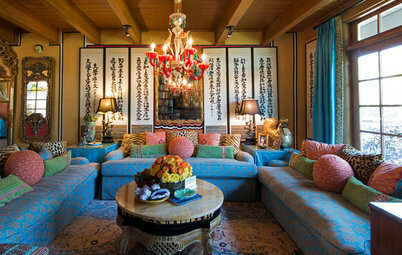 Instead, they decided to go another route by using color to unify the room. 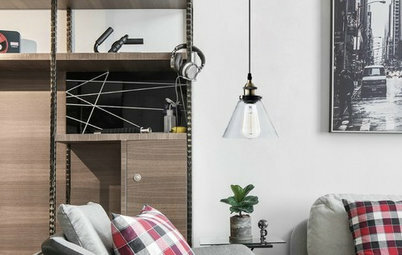 Painting all of the woodwork and walls the same color, as opposed to having contrasting woodwork in a creamy white, helped seamlessly connect the two spaces. The plan was to pick a dramatic shade, and the designers narrowed the scheme down to two contenders: red and blue. Farrow & Ball’s Stiffkey Blue won, with bright red and camel becoming secondary accents. Before painting, the walls and ceiling were professionally replastered. 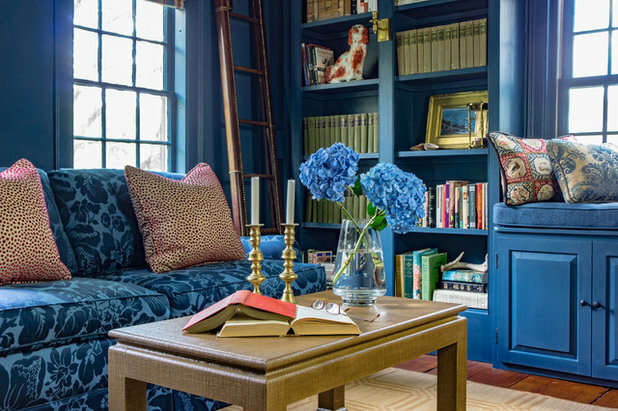 A comfy full-size sofa covered in blue damask allows for guest seating or reclined reading. 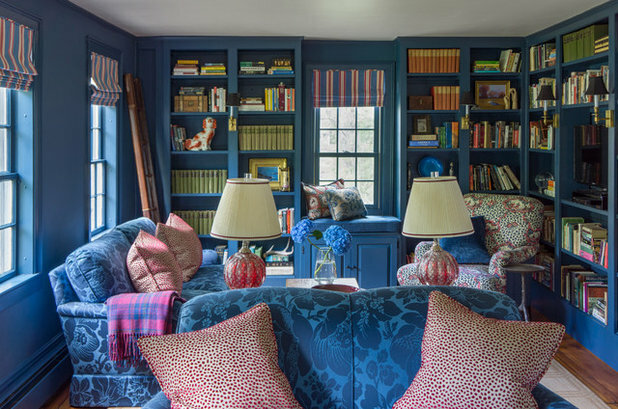 To lighten up the formality of the space, a leopard-print upholstery was chosen for the club chair front and backed with the same blue damask. “It’s fun and whimsical yet sophisticated,” Hamilburg says. A bright magenta footstool the Mitchells already had adds a small but powerful dose of color. 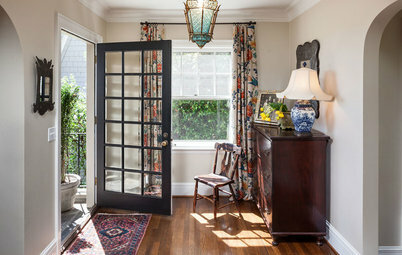 The built-in bookcase was demolished in favor of new floor-to-ceiling bookshelves with an integral window seat. 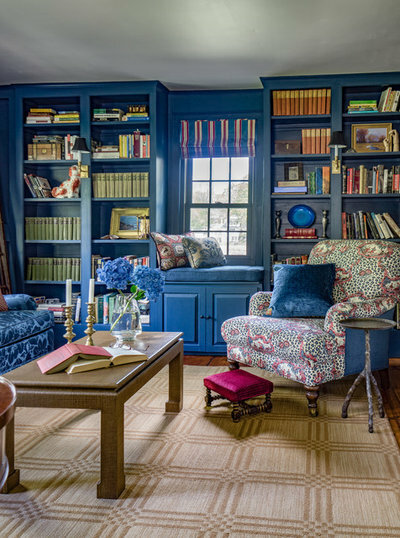 The continuity of the shelving creates the feeling of a genuine library to show off the homeowners’ collection of antique books and heirlooms. Although the shelves are new, one might guess that they’ve been here since the home was built. It wasn’t possible to change out the heat register, but painting it the same blue takes the focus off it. Four candlestick sconces with fabric shades provide soft lighting with a nod to the Federal period. 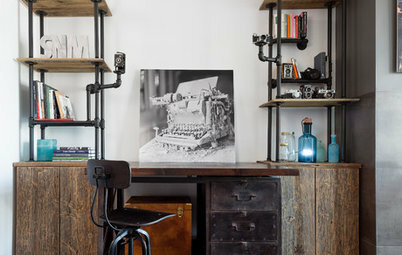 The leather­­-wrapped, nailhead-studded ladder was a consignment shop find from Boston. A central oval console table between the sofa and love seat bridges the two areas. 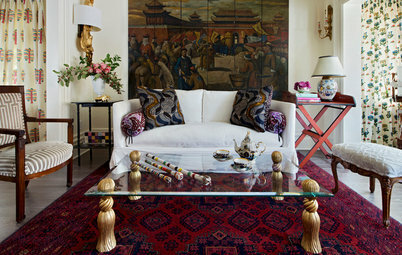 Two tall antique table lamps with bases of red Venetian glass provide a focal point in the middle of the room. The coffee table was one of the project’s splurges. Hamilburg had a wood table wrapped in linen, painted, glazed and topped off with a protective polyurethane finish. She balanced the table expense by sourcing discontinued fabric for the sofa and love seat. Mitchell found the Donghia mohair fabric for a chair, shown in the next photo, on eBay. 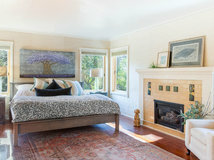 Hamilburg had the Wilton area rug in her inventory and was able to offer it to the homeowners at a steep discount. The grand piano was moved to the corner opposite the fireplace. The love seat and chair create an intimate seating area. Smaller pieces, such as the red ceramic garden stool side table, help maintain enough circulation. Mitchell found the square ottoman and re-upholstered it in leather to serve double duty as a coffee table and footrest. The fireplace mantel and paneled woodwork were refinished. A new convex mirror channels more of the room’s Federal roots, while the watercolor-like glazed porcelain vases lean toward a more contemporary look. Striped Roman shades and spotted throw pillows sprinkle in more bits of red. What a beautiful room! I have the same baseboard units in my house and they are in serious need of painting. What is the best way of doing that? 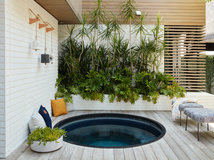 I really like how this space was done it's warm and class looking. I love love the room, what a gorgeous blue. Awesome!